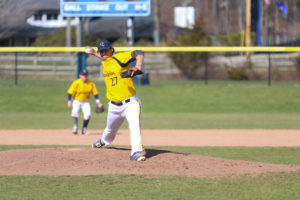 The Quinnipiac baseball team (14-15 overall, 6-0 MAAC) enjoyed back-to-back walk off victories on Sunday afternoon, as it defeated the Monmouth Hawks (8-18 overall, 3-6 MAAC) by an identical score of 4-3 in the doubleheader. With the wins, the Bobcats completed the three-game weekend sweep of the Hawks and maintained their undefeated record in MAAC play. In game one, it was junior outfielder Liam Scafariello who helmed the offense for Quinnipiac. After falling behind 2-0, Scafariello hit a three-run home run in the fourth inning to give Quinnipiac the 3-2 lead, his team-leading sixth on the season. In the final inning, Monmouth jumped on graduate student pitcher Brandon Shileikis and got two singles to put the tying runner in scoring position. Senior pitcher Mike Davis entered the game, but immediately hit a batter to load the bases. Monmouth was then able to tie the game when senior infielder Shaine Hughes grounded into a fielder’s choice, but scored sophomore infielder Dan Abate on the play. With the game tied in bottom of the seventh, junior outfielder Andre Marrero singled and represented the winning run. 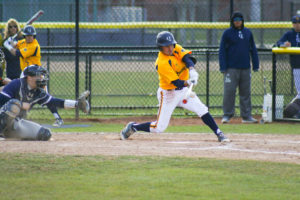 After sophomore infielder Dylan Lutz walked and junior outfielder Brian Moskey flew out, Scafariello ripped a hit into right field and Marrero came around and crossed the plate, giving Quinnipiac the 4-3 victory. Game two was a pitcher’s duel between Quinnipiac junior Tyler Poulin and Monmouth freshman Dan Klepchick. Poulin went 6.1 innings, giving up only three runs, with none of them being earned, while Klepchick went seven innings, surrendering one earned run on five hits. After giving up the lead in the seventh, the Bobcats were able to tie the game at three in the eighth, when Moskey lined a double that scored Marrero. The game remained tied at that score until the 11th inning when senior infielder Ben Gibson smacked in the winning run. A leadoff single by Moskey and an intentional walk to Scafariello gave Gibson the opportunity to get the victory for his team, and he made no mistake, lacing a line drive into left field. 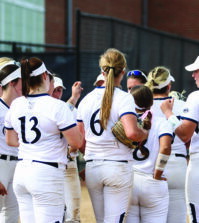 With the two wins, Quinnipiac maintained the top spot in the MAAC, holding a 6-0 record. While the season may already be halfway over, MAAC play has only just begun. Quinnipiac’s next matchup will be against the University of Hartford (9-18 overall, 5-4 America East) on Tuesday, April 10 at 3 p.m. in West Hartford, Connecticut.